A .4U.com domain name is a valuable digital asset that can help you build and brand your online presence. Please take the necessary steps to protect and maintain your .4U.com domains. .4U.com domain names may be registered for a period of 1 to 5 years by an individual, business or organization. The person or entity that registers a .4U.com domain name is called the “user” or “registrant. ” For purposes of this description, let’s assume the user or registrant is you! You can only register a .4U.com domain name through our accredited domain registrar www.encirca.com or a reseller of an accredited partner. The .4U.com Registry cannot help you to register domain names directly. Anyone interested in purchasing a domain name will need to learn about the Domain Name Lifecycle. All domain names start off in the same way. Make a short list of the names you would consider to use for your web site. If the domain is available, the registrar www.encirca.com can register it at your request and on your behalf and the domain name will be added to the authoritative .4U.com Registry database. If the domain name you want is not available, you can continue to search for other options until you find the perfect domain name to suit your needs. 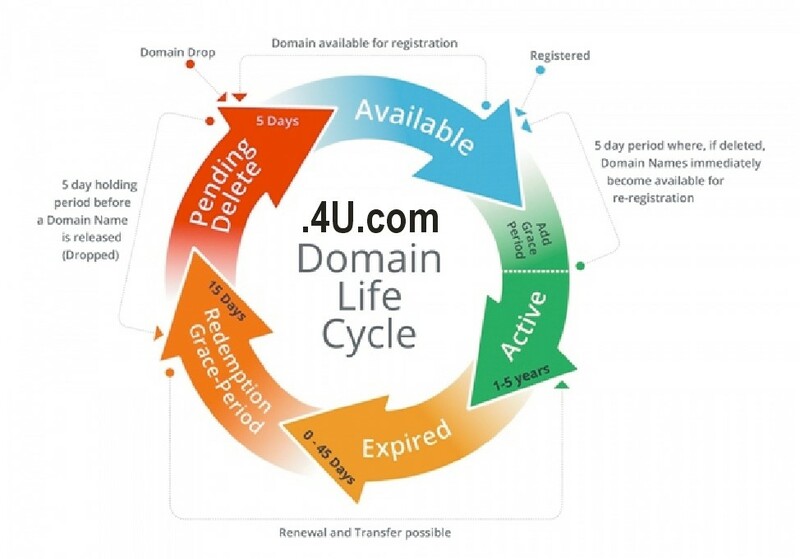 By understanding the lifecycle of a domain name it is possible to regain a domain name that may have accidentally expired, or grab a domain name that has recently been deleted or “dropped”. Renew your .4U.com domain name and .4U.com connect to the World! Just like all legacy domain extensions (.4U.com, .net, .org, etc), it is important to know that when you register a .4U.com domain name, you do not actually “own” the domain. Instead you have secured the right to register the domain name for a period of 1 to 5 years, and you will have the opportunity to renew the name prior to its expiration. Domain names are subject to renewal to ensure that names no longer wanted are removed from the registry database and become available for others to register. .4U.com domain names must be renewed upon their expiration and may be set to renew automatically (“auto-renew”) if the registrar of record permits it, subject to such registrar’s complete renewal and registration policies and terms. Registrars typically have different renewal notice policies, but most will contact you with a reminder via email within 30-90 days of the expiration of a .4U.com domain name. Please remember the reminders will come directly from your registrar, not from the .4U.com Registry. Suspension Status (1-45 days after the expiration date): If you do not renew your .4U.com domain name(s) prior to the expiration date, the domain name will go into a Suspension phase for 45 days. Typically, Registrars will Delete the domain during the 45 day Suspension period if it is not renewed by the customer. However, if at the end of that phase the domain has not been Renewed or Deleted by your Registrar then it will be Auto-Renewed. During the Suspension phase the name-servers are changed to name servers managed by the .4U.com Registry, the domain becomes inactive and a standard Suspension page will appear. Email and any other applications associated with the domain will not be available during this Suspension phase as the domain is inactive. Once a domain is Renewed, the nameservers are restored and the domain becomes active again. Restore Grace Period (RGP) (1-20 days after the deletion date): After a domain is Deleted by the Registrar, if will enter the Restore Grace Period (RGP) phase. The initial phase lasts 15 days and places the domain in Pending Delete (restorable) status. During this phase the domain can still be Renewed, which is charged at a higher fee. Please contact your Registrar for additional pricing and policies around Suspension Status and Restore Grace Period domain names. After 15 days, the domain enters a 5 day RGP Pending Delete (non-restorable) status until it is finally dropped from the Registry on Day 20. Please contact your registrar for additional pricing and policies around Suspension Status and Redemption Grace Period domain names. For information on your Sponsoring Registrar, please see the .4U.com WHOIS to look up your specific .4U.com domain name. A .4U.com domain transfer can involve a transfer from one registrar or reseller to another one; or from one registrant (or legal entity) to another one. If you decide you want to sell, give away or otherwise assign the rights to your .4U.com domain name to a third party, you will need to transfer the domain name. The same is true if you are dissatisfied with the services of one registrar and wish to switch your account to another one. You can only transfer your .4U.com domain name through a registrar or reseller. The .4U.com Registry cannot help you to transfer your domain names directly. To perform a transfer to another registrar, you must have an Authorization Code (Auth-Code). Auth-Codes are passwords for domain names to add an extra security measure to help to ensure the identity of the person or entity making the transfer request. .4U.com Internet can not directly provide or confirm Auth-Codes for your registered .4U.com domain names, please contact your registrar for this information.